Students have the opportunity to develop their skills at written and oral advocacy through mooting. Mooting is part of the International Mooting course and is also covered in the Legal Methods Research & Writing course. With encouragement and support from the Faculty of Law, the students’ law society has organized a programme of mooting. It involves the preparation and presentation of arguments and counter arguments on points of law in a simulated court situation. Success lies not in the winning of the case but in the demonstration of legal skills in making the best argument from the materials available. During the 2012/2013 academic year the Faculty of Law at Mona participated in one international moot competition and one regional competition - Price Media Moot Court Competition and in the 5th Annual Caribbean Court of Justice Moot Court Competition respectively. The teams performed well in both competitions, being placed 2nd overall in the latter. The Mona Law team also won the shield for top academic institution in the same competition. 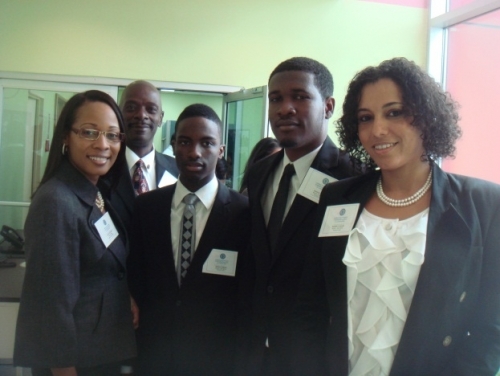 The 2012/2013 Mona Law team at the 54th CCJ Moot Competition, from left to right: Ms. Caprice MacFarlane (Coach), Dr. Leighton Jackson (Academic Coordinator), Mr. Adrian Cotterell, Mr. Jahmar Clarke and Ms. Natalia Casado. 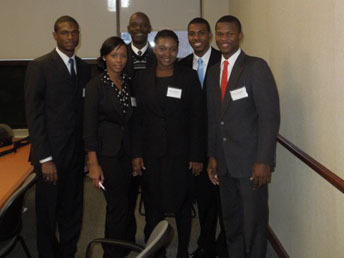 The 2012/2013 Mona Law team at the Price Media Moot Competition, from L to R: Mr. Andre Coore (Coach), Ms. Kacey-Ann Nelson, Dr. Leighton Jackson (Academic Coordinator), Ms. Orene Plummer, Mr. Rushaine Cunningham and Mr. Peter Marshall.